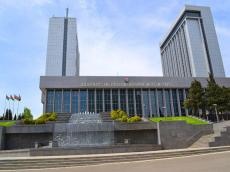 The Azerbaijani parliament approved the agreement concluded between the Azerbaijani state company SOCAR and British BP on production sharing for joint exploration and development on the D230 block in the North Absheron in the Azerbaijani sector of the Caspian Sea. The agreement between the companies was signed on April 26 of the current year. Under the PSA, which is for 25 years, BP will be the operator during the exploration phase holding a 50 percent interest, while SOCAR will hold the remaining 50 percent interest. The D230 block in the Northern Absheron in the Azerbaijani sector of the Caspian covers a structure at a depth of sea up to 300 meters with a reservoir depth in the range of 3,000 - 5,000 meters. Block D230 in the North Absheron basin in the Azerbaijani sector of the Caspian Sea covers the structure at the sea depth up to 300 meters. Its reservoir depth is 3,000-5,000 meters. In May 2016, SOCAR and BP signed a memorandum of understanding on the geological exploration work on potentially promising structures of the D230 block. BP opened its first office in Baku in June 1992. BP remain committed to Azerbaijan’s future helping the country maintain its role as one of the world’s major energy suppliers and create energy links with Europe.